I received coupons to facilitate this review. All opinions are 100% my own. Going back to school was always easy for my family. I had 1 child in school and 2 at home with me still, so the transition was pretty simple. But this year my middle also started school. Having 2 children in school and having to change our entire routine has been a bit... hectic, to say the least. Waking earlier, getting 2 children off to school (my daughter was always easy being as she's 10 already, but getting a 5yr old putz ready is proving to be challenging), hustling with my youngest to the gym before the daycare closes, etc. It's been crazy and a big change and we're all having difficulties adjusting. That's where Foster Farms comes in. Freezer to Table in Under 30 Minutes and helping me Rule the Roost has been a big help. Foster Farms can help you “Rule Your Roost” by providing an incredible range of tasty, protein-rich, super easy-to-prepare meals your family will love. Just think about how stocking up on Foster Farms frozen crispy strips, buffalo wings, chicken nuggets and many other frozen chicken products as well as a variety of corn dogs. 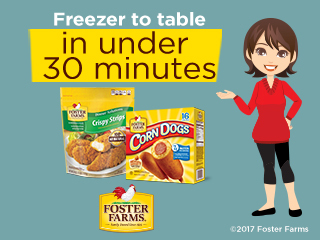 I chose the Foster Farms corn dogs as a quick and easy dinner solution. We almost always just eat them plain with Ketchup, the Honey Crunchy Batter provides enough additional flavor. 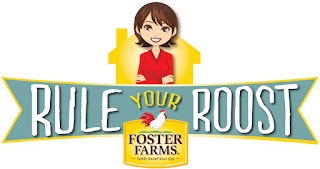 We absolutely love Foster Farms, they make it so quick and easy for my family to enjoy a good meal and take a little stress off me. I hate the "it's 5:30 OH NO, what's for dinner" days and now Foster Farms has me covered. I try to have a plan for meals on busy nights. I like to do crock pot meals and do meal prep. Maybe my kids should answer this one, because most of the time I wonder who is actually in charge!! I meal plan weekly and try to prepare ahead! How do you Rule the Roost at home? You would have to ask my husband that! I prepare things the night before. Does sending my husband out for food count?? haha :D Truly, I hate cooking and love to have frozen foods on hand. I try to be considerate of everyone and what they like. Its kind of a pain sometimes but they are easy to feed I guess. I am the one that runs the calendar for the week. I m also the one that does the meal planning. I try to plan on the weekends and prepare as many meals as I can to save time. I do not "Rule the Roost" at home nor elsewhere. I plan our meals out a week ahead of time. I keep everyone on schedule and get them to where they need to go. I try to plan all meals in advance. Whenever possible I use my crock pot and double up on recipes and freeze half for a quick meal at a later time. I plan our meals a week in advance when I go grocery shopping. I plan out what to make all week and then keep a list to keep me organized. I like to invent new dishes if I feel like cooking big batches of something. Otherwise it is cold cuts or microwave meals. I make up my own recipes. I rule the roost by being the who takes care of everything from cooking to cleaning. I kind of think the roost is ruling me! I rule the roost with Foster Farms frozen crispy strips. We love having them for Sunday suppers. I like to have a plan set in place, so I know what I'm doing and when I'm doing it. I rule the roost because I am the only one living in my home. I rule the roost by finding great tasting meals for those busy school nights! Even though we are so busy some nights....still need to have a great dinner! I plan the meals and transport places. We all make decisions in my house. I try to get everyone together for dinner with helping and making what we all like to eat !